Our hungry crew took on a branding project from the ground up and reimagined an established restaurant where gourmet food + local beers get in on the fun. An iconic logo that sets the tone. 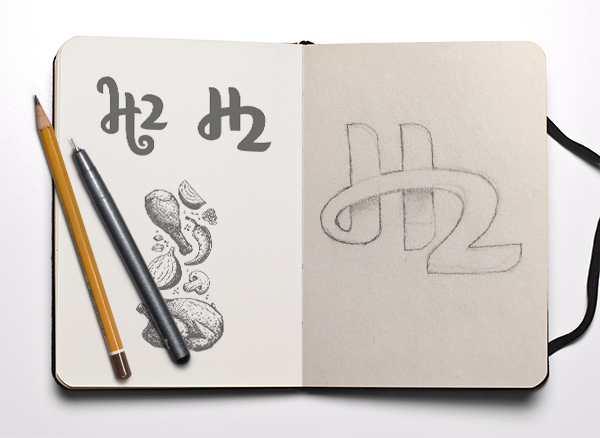 The restaurant was “H2” before we even got involved, and our job was to create a story, reason or purpose for this name choice. Howard Hughes made this iconic landmark famous in the 1950s, but that’s not where this was going. We liked the combination of “H” words, so quickly chose to play up that angle with “Heat & Hops” to help connect the rotisserie and craft taps that would define this place. “Hoot & Holler”, “Harbour + Heights”, and even “Hmms and Haaas”… this legendary Vancouver spot had a meaning to call its own! H2 flamed to life, and where was once a typical hotel restaurant, now sat a fun place, full of delicious food, great beers + cocktails, that didn’t take itself too seriously. Cue up the puns that followed and you have an iconic West End Vancouver hot spot that’s ready to poke some fun at itself. A simple layout that’s easy on the eyes. With a custom-built online order system, getting take-out is a snap! All your favourite feeds in one place. Menu design, layout, mock-ups + press files.